Picture an island nestled in the Mediterranean Sea. Stirs up dreamy holiday visions of sunshine, warm sand and calm blue waters, doesn’t it? Canadian soldiers serving with UN peacekeeping forces in Cyprus unfortunately met with a harsher reality. The Canadian War Museum invites you to share in the memories of Canadian peacekeepers who served on the island. Join them in their long journey towards a lasting peace. Cyprus is a tiny, sunny Mediterranean island measuring little more than 9,000 square kilometres – less than the size of Nova Scotia’s Cape Breton Island! Following a long history of foreign occupation, and nearly 100 years as a British possession, Cyprus was granted its independence in 1960. In 1964, tensions stemming from a constitutional crisis pitted the Greek-Cypriot majority (81%) against the Turkish-Cypriot minority (18%), resulting in violence that threatened to degenerate into war between Greece and Turkey. The government of Cyprus requested an intervention by a United Nations peacekeeping force. The Canadian government agreed to send a contingent, beginning Canada’s longest participation in a United Nations peacekeeping mission. The arrival of 1,100 Canadian soldiers sent to join the United Nations Force in Cyprus (UNFICYP) in March 1964 helped to quickly quell the violence as they began patrols along a narrow buffer zone between Greek and Turkish forces known as the “Green Line”. The UN-controlled buffer zone stretches across the entire island, and measures 4.7 kilometres at its widest point and 3.3 metres at its narrowest. During the first ten years of the UN’s presence on Cyprus, conditions were occasionally tense but mostly peaceful, as UNFICYP managed to resolve local disputes before they escalated into island-wide conflicts. This situation changed in July 1974, when a Greek-inspired coup against the Cypriot government led to renewed fighting and an invasion of 40,000 Turkish troops. Canadian and other peacekeepers on the island were trapped in the middle of a war zone. In the ensuing combat, Canadians placed strategic locations under UN control and evacuated civilians, and attempted to negotiate ceasefires. Two Canadians were killed and 17 were injured in July and August 1974, when hostilities ended. Canada ended its major contribution to the Cyprus mission in 1993, yet today a single member of the Canadian Forces serves on the staff of UNFICYP. The international force now includes 1,064 personnel, with soldiers, police officers and civilian staff. Approximately 30,000 Canadians walked the “Green Line” over the course of Canada’s 29-year contribution to the UN peacekeeping mission. Some of their fascinating tales are brought to life in the newest module of the Canadian War Museum’s Canadian Experience Gallery 4 – A Violent Peace, which explores Canadian military history since 1945. 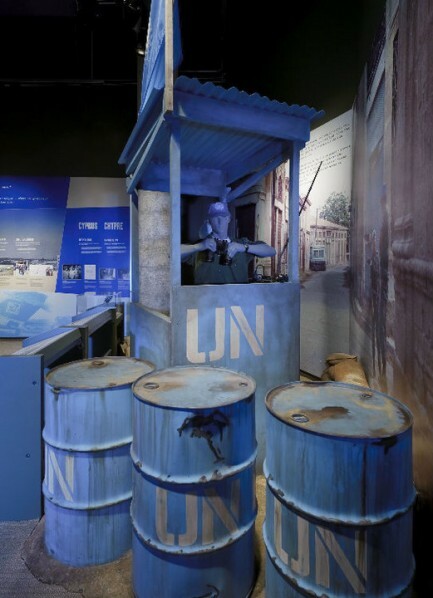 The new module features reconstructions of a UN observation post and a section of the Green Line, as well as artifacts and oral histories from Canadians who served on the mission. Among other stories, the exhibition highlights the experience of Michel Plouffe, who was shot while trying to administer first aid to his platoon captain during the 1974 crisis. The bullet ricocheted off Plouffe’s helmet into his jaw, breaking it. Plouffe spat out the bullet and pocketed it, and waited with his captain until both men could be evacuated. Plouffe’s helmet and bullet, now on display, bring this dramatic scene to life…in spine-tingling detail. With this new exhibition module, the Canadian War Museum reminds us that peace is indeed a fragile thing…and that the Canadian experience of peacekeeping was often far from peaceful.